Pritchett wears a polka-dot dress from Forever 21 with her black wedges and bow. Photo by Lauren Puckett. Well, here we are — January 29. It’s almost 70 degrees outside and storming, not snowing. And that means RBHS students have torn through their wardrobes, bringing out the shorts, skirts, dresses and short-sleeved shirts. 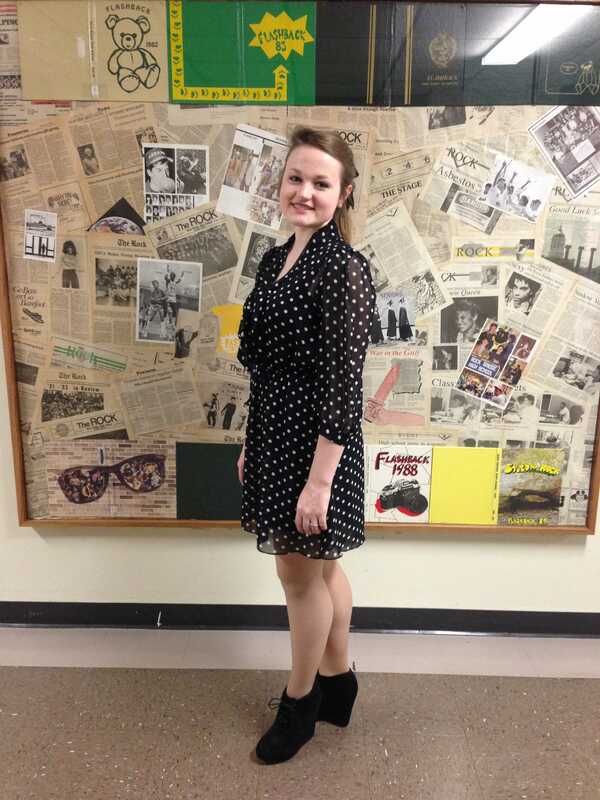 I found senior Sarah Pritchett today, wearing not a coat and scarf, but a pair of black wedges and a polka-dot dress. I loved the ensemble and immediately picked her for the style of this strange, stormy week. Which Style of the Week has been your favorite so far? Let us know in the comments below! My name is Lauren Puckett, and I’m one of the A&E section editors for The Rock. I’m a senior, and a member of City Lights show choir and the Varsity Acting Squad. Besides singing, acting, and participating in my church’s activities, I like to write every story I can get my hands on. Writing is what I love, and it’s what I want to do with my life. Other than that, I’m a ridiculous blonde who likes Arnold Palmer and raspberry yogurt pretzels. I’m a Ravenclaw and I’d probably hail from District 8 or 11, although I doubt I’d survive the Hunger Games. Feel free to shoot me an email or come say hello—you’ll probably find me in the choir hallway or the journalism room. You know us “artsy kids”—we don’t ever leave our roost. To contact me, email me at lpuckett@bearingnews.org.